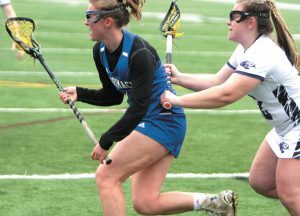 Meanwhile, heading to the GNAC where former Hollis Brookline standout Cassandra Stapelfeld had a superb season at Simmons University after transferring in the summer from Endicott College. Stapelfeld was one of the most prolific scorers in the NCAA, ranking seventh in the nation with 21.8 points per game in 25 games, while ranking second among GNAC players. She established herself as one of the region’s best players early in the season after being named the New England Women’s Basketball Association Player of the Week and was tabbed to the D3hoops.com Team of the Week for the week of November 19-25. The sophomore averaged 25.0 ppg vs. the top three teams in the GNAC (No. 12 Saint Joseph’s College (Maine), Emmanuel College and Albertus Magnus College) and finished the season with a school-record 546 points. She was one of the conference’s most consistent scorers, netting 11 or more points in all but two games, including the first 18 games to start the season. Staplefeld broke the school record with 42 points in a game back on Jan. 29.